What are the benefits Cloud Computing? Cloud computing is a style of applying technology that can bring significant value to all sizes and types of organizations; including yours. 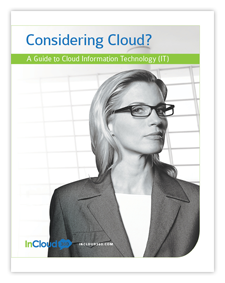 At InCloud360, we leverage cloud computing as one method to optimize your business. Cloud computing can be a less costly way to provide IT-related services largely from paying for cloud computing services in proportion to use, rather than by purchasing hardware and software directly. The cost is moved from capital expense to operating expense, which means the cash flow impact is spread over the usage of the resource rather than heavily weighted upfront. Therefore, cloud-based services have financial advantages when capital is constrained or cash flow is under pressure. Cloud computing has exponential scale without the associated expense because it removes the need for staff augmentation during peak times and avoids over provisioning of hardware & software. This means you don’t have to invest in infrastructure to support peak times during the day, week or seasonal inflections because the cloud solutions operates in a shared pool of resources. The services are transparent so understanding the total cost is easier. In many organizations, the invoice may be sent directly to or the finance department applies the expense directly to the department using the service therefore the IT organization does not have to manage complicated allocations. In comparison to traditional on-premise hardware and software, the upgrade and migration costs are reduced including the time and effort to manage the processes. The potential for business interruption is reduced as well. Cloud computing provides the ability to stay current and flexible without incremental costs because the service provider is always developing new services and leveraging the latest technology. Cloud computing provides IT capacity and capability, very rapidly, without the need for capital. Most cloud providers have tremendous leverage with hardware vendors and expertise in virtualizing storage, networks, processing and others that even the largest enterprises have difficulty matching. Cloud computing also frees up internal capital, technical talent, and management resources for more mission-critical applications. In many cases, it improves the quality of service delivered by IT. Accountability of resource consumption is clearly in the hands of the business user as the service expense can be directly tied to the consumer, in lieu of unclear allocation methods. Cloud computing enables agility, speed and flexibility by allowing rapid deployment of the initial cloud computing services and future extensions & services increasing the ability to meet dynamic business requirements. Cloud computing minimizes the focus on the technology underpinnings and refocuses it on the services that are delivered. With cloud computing, the role of the IT organization can shift toward driving fundamentally new capabilities and dramatically restructuring processes that deliver more value to the business, rather than incrementally improving commodity processes. Cloud computing minimizes the focus on the technology infrastructure and refocuses it on the services that are delivered. Cloud computing also frees up internal capital, technical talent, and management resources for more critical issues such as focusing on developing products and services as well as growing the business; fast growing start-up technology companies leverage the cloud in this way. Cloud computing can provide enterprises with the capability to do things that otherwise couldn’t be done technologically, were not economically feasible, or would otherwise be deferred due to resource constraints. This is especially true for SMB/SMEs because they don’t have the large budgets, the capabilities and size of staff that large companies do. Upgrade and migration costs of on-premise hardware and software are reduced including the time and effort to manage the processes. The potential for business interruption is reduced as well. The cloud computing model is based on standardization which can bring significant efficiencies and lower costs. High customization requirements will reduce the fit, although can be provided via extensions and customizations. Cloud computing brings real mobility with access to your systems anytime, anywhere and from any device.